I recently attended the Efficiency Vermont’s Better Buildings by Design conference and met some great people who are doing innovative things in the world of sustainable construction. There were some truly insightful presentations by leaders in the green building industry talking about everything from optimizing variable flow pumps to energy-saving building retrofits in Vermont. But it always amazes me that—even at a conference packed with people interested in sustainable building design—so few people understand the power of mechanical insulation. In my last post I wrote about why you should include mechanical insulation in your efficiency upgrade. This week I want to talk about why insulation should be included in the plan/spec phase of new construction planning. In new facility construction, mechanical systems are obviously carefully planned and selected. Today, these systems are often selected largely based on the efficiency factor. With so many new construction projects going for LEED certifications and other green initiatives, energy savings is becoming more important than ever. 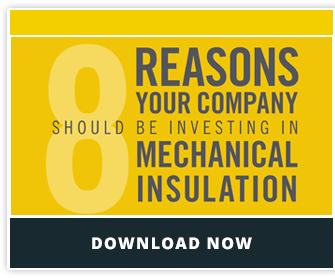 Mechanical insulation can help contribute significantly towards energy saving and helps buildings achieve their sustainability goals. Those energy-efficient mechanical systems that were so carefully selected become even more cost-effective when they’re properly insulated. According to Mechanical Insulation Industry Professionals , if a simple valve is properly insulated with 2 inches of insulation, within a year the building would save 49 million Btus of heat loss, 7,600 pounds of CO2 emissions, and 15 pounds of nitrogen oxide emissions. When insulation thickness exceeds ASHRAE requirements, it counts toward LEED credits for optimizing energy performance. The fact that more and more people are choosing energy efficient equipment for their facilities is great news all around. Pair those efficient mechanical systems with the proper insulation, and the savings is drastic. Whether you’re upgrading your facility or building a new one, insulation should be considered whenever sustainability and environmentalism are concerned.